Squash House Quilts: Fun Gadget and Another Give-away! In a previous post I mentioned how much I love gadgets - not just for sewing and quilting - but any kind of useful gadget! CJ turned me onto this great company a while back - Kuhn Rikon. I purchased one of their pressure cookers, which I just love. When the pressure cooker arrived, it came with a catalog which I promptly flipped through and found The Corn Zipper. 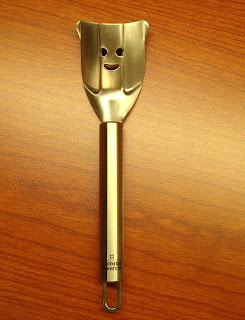 This happy little guy intrigued me ... I thought about ordering one, but put the thought aside at the time - I mean, why buy another tool? It happened that my husband and I were in a kitchen store not long after where I saw that happy face again and decided to take the plunge! He laughed - knowing I go crazy over gadgets - what the heck would this thing do - and would she even use it! Well let me tell you - this tool is worth it’s weight in gold! You hold an ear of corn in your left hand, place the tool so the happy face is facing you at the top of a row and drag it down the ear….voila…you’ve neatly stripped off a row of corn. Finish up around the ear and the corn is ready to be added to whatever recipe you’re using. Beats the heck out of cutting with a knife and worrying that you’re going too deep, and my husband approves! Here is another fun gadget I purchased recently. I had high hopes for this one as I love to do Redwork in the evenings while watching TV. Aging eyes need all the help they can get! The gal in the shop promised that they were able to thread 3 strands of DMC floss on the first try! 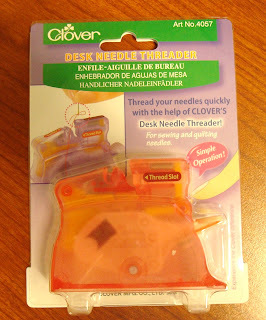 Problem is, I didn’t read the back of the package (nor did the clerk tell me) - it isn’t suited for embroidery needles! Drat. 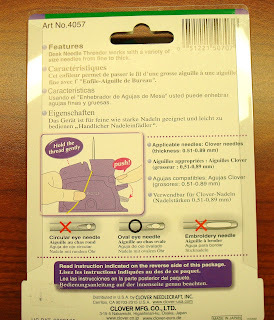 Perhaps someone out there is a hand-quilter or uses an oval eye needle and can use this….it’s brand new. Leave me a comment on this post and I will pick a winner at random on Saturday. Love a good tool!! Where was this post a week ago when I was cutting ear after ear of corn and freezing it. I had some cheepy thing from the grocery store and it was miserable. Went with the knife. I'd love to be considered for the needle threader thingy!! Wow, I am a hand quilter but I don't even know what kind I use. And I go through a lot! Maybe I should see if there is a spot on the web with some info. To clarify that foggy comment I just left, maybe there is a website that defines needles. I'm going to look.